Place an order over $200 in my Canadian online store. Host a private party or class with your friends and family. Collect orders from friends and family and do a catalogue party with you as host. And the best thing is from now until the end of June, with a qualifying party/order of $400, you will receive an EXTRA $40 in Stampin' Rewards! That's in addition to what you already qualify for. With a brand new catalogue that isn't hard to do! Several demonstrators across the world are doing a blog hop to showcase the fabulous host sets in the current catalogue. Be sure to check them all out, you will definitely be inspired! 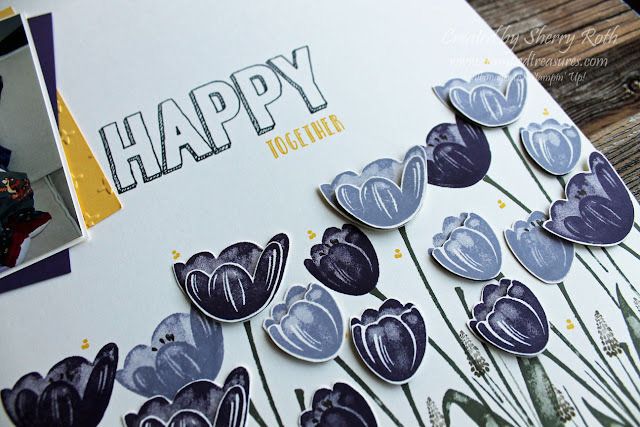 Top of the list of host sets was the Tranquil Tulips stamp set. This tulip set is GORGEOUS! I have seen so many stunning cards created with it on Pinterest. But I decided to add it to the bottom of a layout and I love how it turned out! The added dimension that you get by simply cutting out the tulips is amazing. It almost gives it a whole new look. So pretty! I've included a full supply list below if you'd like to add any items to an order or are curious on the colours I used. You are visiting the blog of Sherry Roth, be sure to visit the next person in line for more inspiration!